From the Mediterranean diet to the raw foods diet, many food plans recommend eating fresh fruit at every meal and for snacks. The benefits of eating fruit are numerous. Eating fruit before a meal can help you eat a balanced, nutritious diet and practice portion control. If you have blood sugar problems or other health concerns, speak with a doctor or nutritionist about eating fruit with every meal. The Harvard School of Public Health states that eating a diet based on plant foods is your healthiest option. Its nutrition pyramid places plant-based foods like fruit, whole grains, legumes and vegetables at the base of the pyramid. Eat diverse fruits, including citrus fruit, orange-skinned fruit, yellow-skinned fruit and berries to maximize the nutritional value of your meal. Starting your meal with fresh fruit, such as a fresh fruit salad, ensures you meet the American Heart Association's recommendation of consuming 4.5 cups of fresh produce daily. Starting a meal with fresh fruit can make you feel more full. 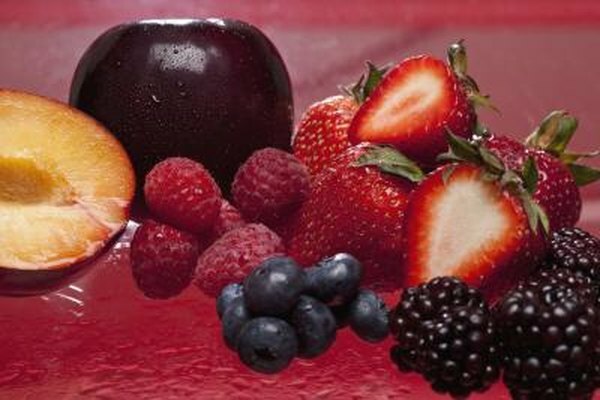 The high soluble fiber content of many fruits, especially apples, citrus fruit and berries, means you spend more time chewing them. You slow down your eating. By the time you begin eating your meal, you will feel more satisfied and be less tempted to overeat during. The filling effect of fruit also stops you from snacking too much between meals. Most fruits are not energy-dense foods. This means they have relatively low calories per serving. In addition, they contain high amounts of water, which benefits your body's nutritional needs without adding calories. People who want to lose weight or maintain their healthy weight can use fruit to replace energy-dense appetizers, soups and salads that contain whole milk dairy products, saturated fat, trans fat or sweeteners. Eating a fresh fruit salad or an apple instead of a bowl of chips before a meal can save you around 400 calories. When selecting fruit to eat before a meal, fresh is best. Dried fruit may have high fiber, but also has higher sugar content and calories due to dehydration. Juice drinks and packaged fruit smoothies often contain added sugars or fats making them higher in calories and not as nutritious. If you want to diversify your fruit choices, try lower-calorie options like baking an apple with cinnamon or topping a bowl of mixed berries with a small spoonful of nonfat Greek yogurt. Blend frozen banana chunks with a splash of nonfat milk or nut milk for a rich frozen custard.